Puzzle connections, Colors, Easy Install! 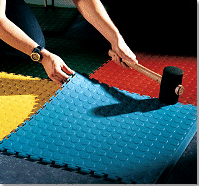 Cover the whole floor or make just a mat! Diamond & Coin Top, Puzzle connections. Case of tiles = 8 tiles in each box. Modular design makes it portable and replacement of a specific tile is a breeze. The original Flexi-Tile. This Modular tile is industrial quality but can be used in the home or commercial work place. Easy to install with its puzzle like connections and movable if needed (for trade shows or mobile offices). A great permanent floor, connections are secure and this tough PVC flooring can with stand a lot of punishment. If ever needed you can replace or change out any tile, not the entire floor. Create patterns, pathways, areas of interest with different colors, mix and match. Lay Flexi-Tile over your floor not just for the beauty, protection and usefulness, but for the comfortable Anti-Fatigue benefits. The Coin top is not just for beauty and interest, it creates a safer traction surface. and can be laid over virtually and surface with minimal effort. Tiles sizes are; 20.5″ x 20.5″. Each tile covers approx 2.918 square feet and weights 4.25 lbs. Thickness is 4mm or .177 inches (1/7″ or a touch more than 11/64″). It is injection molded with the cleanest and highest quality pure PVC available. Commercial, industrial and residential uses: garages, basements, retail stores, offices, storage rooms, workout or fitness centers, recreation or hobby areas, table tops, laundry rooms, factory floors, trade shows, and so much more. ​Case of tiles = 8 tiles in each box.